Lucy Brazier, our Christmas Hamper Course tutor here at River Cottage, shares her hedgerow version of the Saucy Haw Ketchup adapted from the wonderful Pam Corbin’s River Cottage Preserves Handbook. 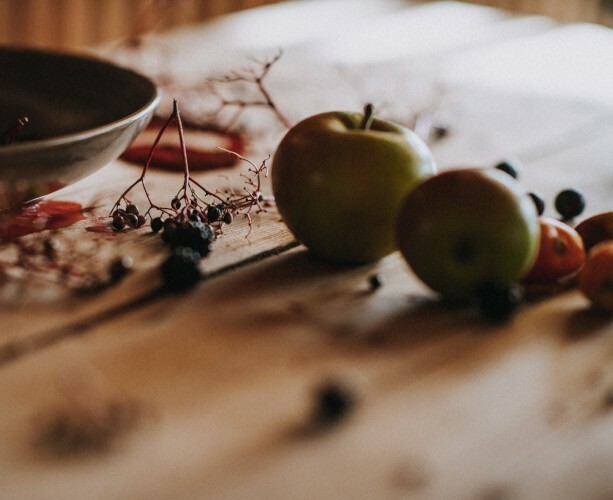 Rinse the berries and crab apples in cold water, picking out any stray stalks. Roughly chop the apples (no need to peel or core them) and put in a pan with the berries. Cover with the vinegar and 300 ml of water, add the spices and simmer until all the fruits are soft (if using haws simmer until the skins split revealing the yellow flesh and soften). Take off the heat. Rub the mixture through a sieve to remove any stones, cloves and skins. Return the fruity mixture to a clean pan. Add the sugar and heat gently, stirring, until it dissolves. Bring to the boil and cook for 5 minutes. Season with salt and pepper. Pour into a sterilised bottle and seal with a vinegar-proof cap. Leave for a couple of days. Use within 12 months. Join us to make a beautiful selection of homemade festive produce to share with friends and family at Christmas.